Join the Peer Network! Click here to fill out the contact form and make sure to select CHW Peer Network as the subject. Community Health Workers (CHWs) serve as a bridge between the health care system and the communities to which they belong. CHWs provide their communities with information about health issues that affect them and link individuals with the health and social services they need to achieve wellness. Community Health Workers are known by many names, yet the work they do unites them under a common goal: to advocate for and assist their clients to achieve the optimal level of health and wellness. 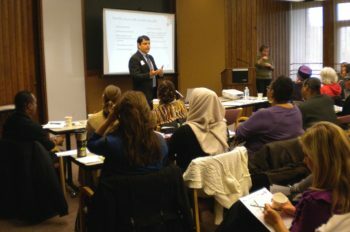 The Minnesota Community Health Worker (CHW) Peer Network is open to professional and lay CHWs across the state, and has active members from many cultural communities. Our members are working in diverse settings and supporting their clients and patients on a broad scope of health concerns. WellShare has educated over 6,000 CHWs internationally, and has a base of over 600 members in Minnesota. The Peer Network is hosted by WellShare International. It offers quarterly trainings for members and manages a listserv to quickly get information out to members. During the CHW Peer Network trainings, timely and actionable information is presented by experts to the diverse audience of CHWs. The Minnesota CHW Peer Network is made possible by a grant from the Eliminating Health Disparities Initiative (EHDI) of the Minnesota Department of Health’s Office of Minority and Multicultural Health, through an appropriation from the Minnesota State Legislature. View past trainings – click here to be redirected to our YouTube channel.